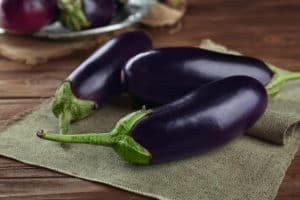 The history of ratatouille has it’s origins in France (in Provence & Nice) & was peasant food due to the availability of vegetables out of the garden. It means “stirred up” or “mixed up” essentially. Traditionally it was often more stew-like & is still very practical & affordable to make. The way we arrange the veggies in this recipe make the end result more tidy & less mixed up. It’s all a presentation thing. You can certainly chop the veggies all up & toss together instead … the taste will still be magnificent! There are pictures showing various ways as well as the one described. 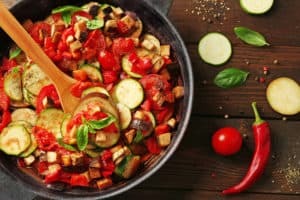 Did you ever see the Disney movie “Ratatouille”? I adore it & have it filed with my other “Chef movies”. I find it endearing that the mouse is named Ratatouille — he’s a french country mouse from simple upbringing –> which is a nod to the dish of the same name. 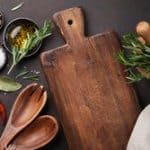 I think that just as in French cuisine, so many of the classic recipes have their root in being “food of the people” and are not as intimidating as we might think! What is one dish you have always wanted to make that “sounds” too hard? 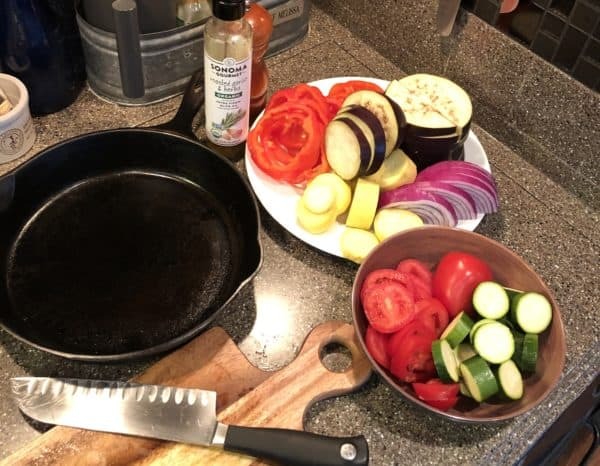 I adapted this recipe from one I found years ago for skillet ratatouille. 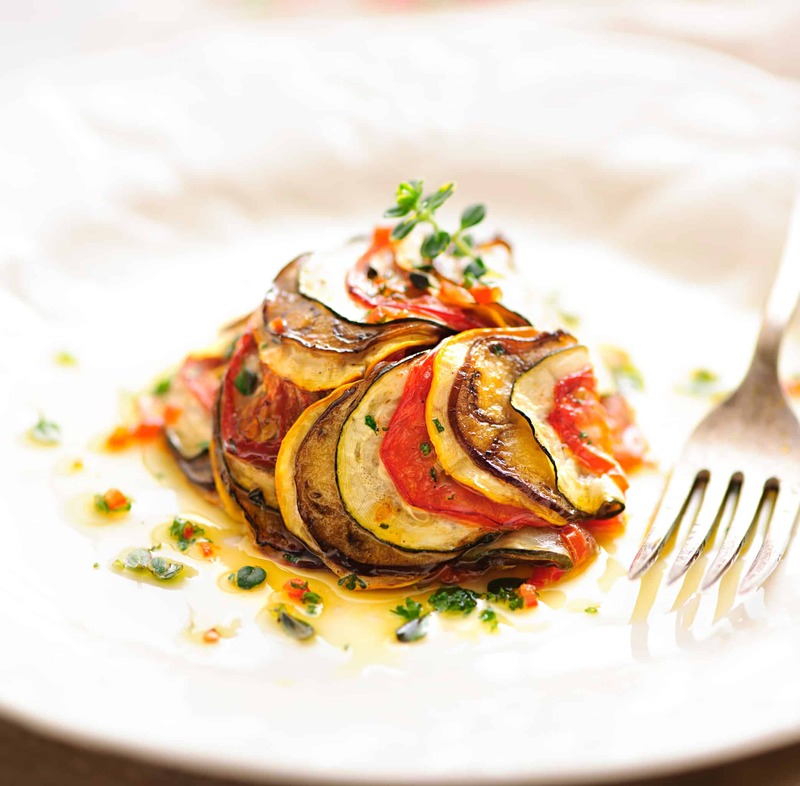 I LOVE ratatouille & hope you will give it a try as either a side dish or a great vegetarian meal. … BUT, don’t forget the loaf of crusty French bread, some great cheese & a bottle of table red wine! If you wish to serve ‘on the side’ instead of as a meal, may I suggest a roast duck, leg of lamb or veal? Then you can finish with a proper pear tarte tatin … Very French INDEED! Note that veggies can vary in size greatly so my amounts are based on what I used & may not be exact! Use your judgement. You may have enough to save for salad or roast vegs another night! 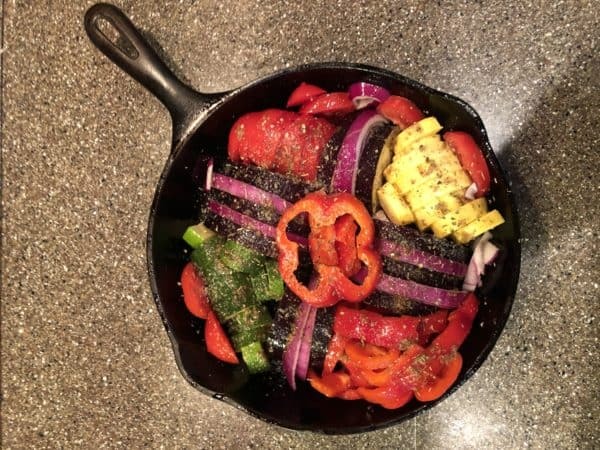 Also, you will want a sizable cast-iron skillet (like a #11, #12 or #13 pan which are between 12-14 inches) to make the perfect circle with the veggies, or smaller veggies. I have also used a 'standard' #8 which is about 9 inches in the bottom (the top is more like 10 & 1/2). IF you don't own cast iron, you may use a casserole dish instead. 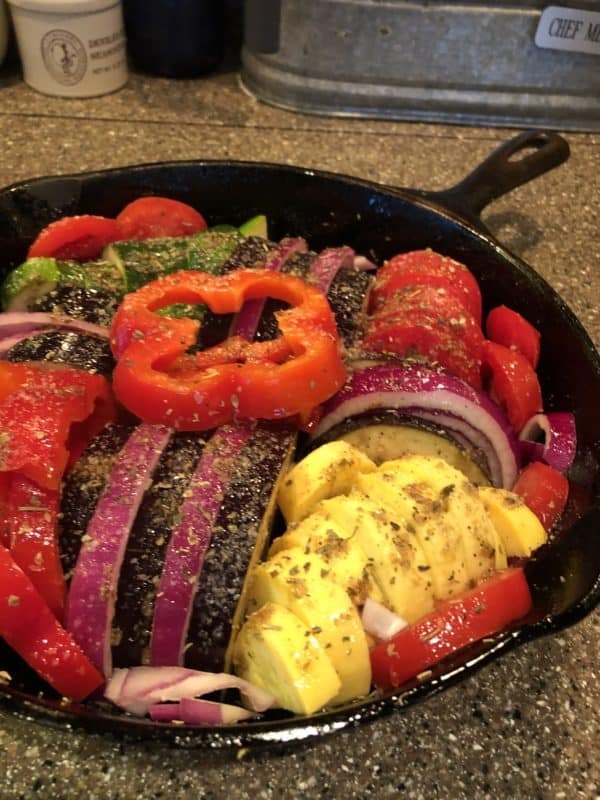 Place cast iron pan on stove top & drizzle with a little olive oil. Turn heat on medium. Add garlic & sauté for 5 minutes. Add enough pasta sauce to put about 1/2 - ¾ inch of sauce in bottom of skillet. Turn off heat after a minute. This looks awesome. Teresa and I will have to give it a try in our RV Oven. IT IS delicious!! I hope you enjoy!